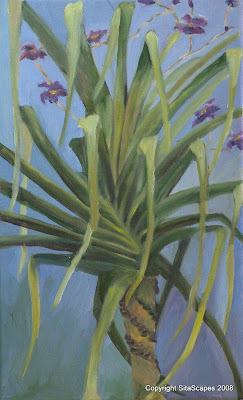 Artists Comments: Not particularly comfortable with still life florals, I was apprehensive of painting at the nursery but, decided it would be a good learning experience for me. This particular specimen grabbed my attention due to its unique tornado-like growing pattern and contrasting shadows and highlights. Whimsical flowers were in the background and I decided to keep them as I felt it gave the painting some additional interest other than the main focal point.